Whether you are planning on adding new services to increase customer revenue or adding differentiated services that give more value to your customer, Netwrix has a business model to support your revenue goals. Our subscription license model is designed to offer significant margins and flexibility in your service offerings. Lack of transparency into what Managed Service Providers are doing within the IT infrastructure is still one of the key concerns for the organizations that are considering the transition of key areas of IT infrastructure to a managed services model. Netwrix Auditor enables full transparency of managed environments by providing a complete picture of Managed Service Provider actions across the customers' environments. If your customers are required to pass regulatory compliance audits, they will need to prove to the auditors that compliance policies and controls are in place and that they are sufficient to maintain the integrity, availability and security of information systems and sensitive data. Netwrix Auditor enables internal controls across the entire IT infrastructure and provides human-readable reports required to prove that the organization’s IT compliance program adheres to PCI DSS, HIPAA, SOX, FISMA/NIST800-53, COBIT, ISO/IEC 27001 and other regulations. Your goal as an MSP is to ensure the permanent availability of IT services for your customers. As economies of scale are huge, by automating routine workflows you will not only be able to provide uninterrupted service but also reduce your own costs. Netwrix helps you get routine, repetitive tasks off your plate and meet uptime SLAs by automating password resets, account lockout troubleshooting and inactive user-account tracking and deactivation. 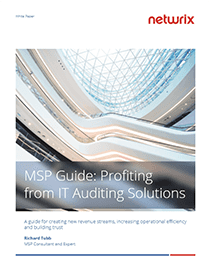 This increases the operational efficiency of your MSP business and keeps costs down. In addition to on-premises deployment, Netwrix offers deployment options that can speed time-to-value by getting you up and running in just 15 minutes. Download our virtual appliance, which is ready to run on Microsoft Hyper-V andVMware hypervisors. 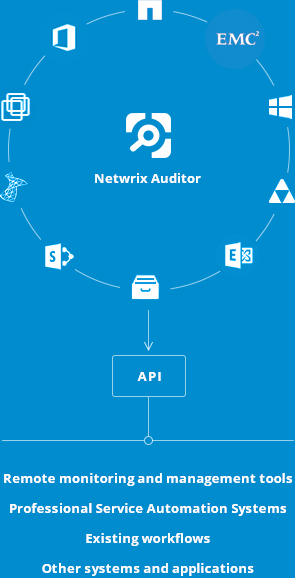 Visit the AWS Marketplace or Microsoft Azure to deploy Netwrix Auditor in the cloud. 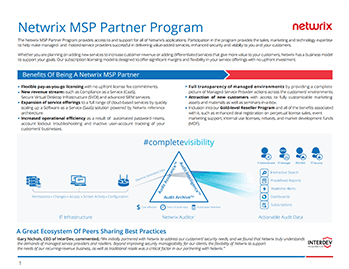 "Partnership with Netwrix will help us grow our business and be an additional differentiator in our managed services field. We do believe that it will be a revenue generator for our company and provide higher security for our clients." Detection of configuration changes is one of the key tactics that all enterprises should consider incorporating into their standard security practices. Auditing is generally a rather difficult task, especially if done manually. 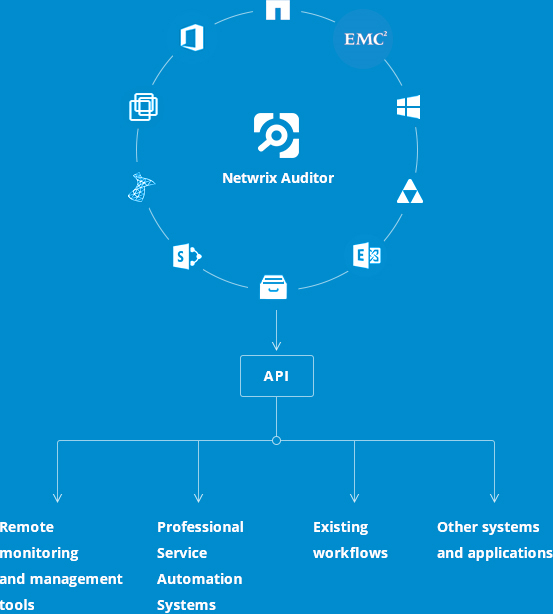 All of the many details you need to consider and remember are taken care of by Netwrix Auditor. Full five out of five stars and recommended to anyone with an AD environment give the product a whirl. Configuration auditing tools help you analyze your configurations according to best practices, enforce configuration standards and adhere to regulatory requirements.